Time to call it what it is and give it it's own special place here. He didn’t even pretend otherwise. CARLSON: This bill has as one of its centerpieces a tax-cut for investors that would primarily benefit people making over $250,000 a year. They’ve already done pretty well in the past ten years, as you know. TRUMP: Yeah. Oh, I know. CARLSON: — than the counties that voted for Hillary, the more affluent counties. TRUMP: I know. It’s very preliminary. CARLSON: It seems like maybe this isn’t consistent with the last election. TRUMP: No. A lot of things aren’t consistent. But this is going to be negotiated. "Reject any legislation that cuts, weakens or privatizes Medicare or Medicaid. Tens of millions of Americans rely on these critical programs. Congress must expand these programs to cover more people, not cut them to give millionaires and billionaires huge tax breaks." I hate that it hurts anyone -- don't get me wrong.... but it's hilarious that an overwhelming percentage of people it's going to hurt are Trump voters in the first place. bannination wrote: I hate that it hurts anyone -- don't get me wrong.... but it's hilarious that an overwhelming percentage of people it's going to hurt are Trump voters in the first place. Yeah, but we've seen what happens when poorly educated working class white voters are economically stressed. It's not pretty. This Thursday, March 23, the U.S. House will vote on legislation that would kick 24 million people off their healthcare and give a $600 billion tax break mostly to the wealthy and big healthcare corporations. Thursday is the 7th anniversary of President Obama’s signing of the Affordable Care Act. If we had affordable care, we wouldn't need to subsidize insurance premiums, thereby subsidizing insurance companies, who love to deny payment. Not that I want the republican assholes to take coverage away from anybody; without it, we're toast. Current Trump Tweet: "Big day for healthcare. Working hard!" Uh huh. In the same sense that Dec 7th, 1941 was a big day for Pearl Harbor. rstrong wrote: Current Trump Tweet: "Big day for healthcare. Working hard!" So 45 just pulled DonTcare. It is sickening to know it couldn't pass, not because the majority were OK with AHA, but because the AHCA doesn't go far enough. It's also amusing (y'all know what I mean) that the Toddler-in-Chief took his ball because they didn't want to play by his rules. That's how utterly incompetent the right is on healthcare. 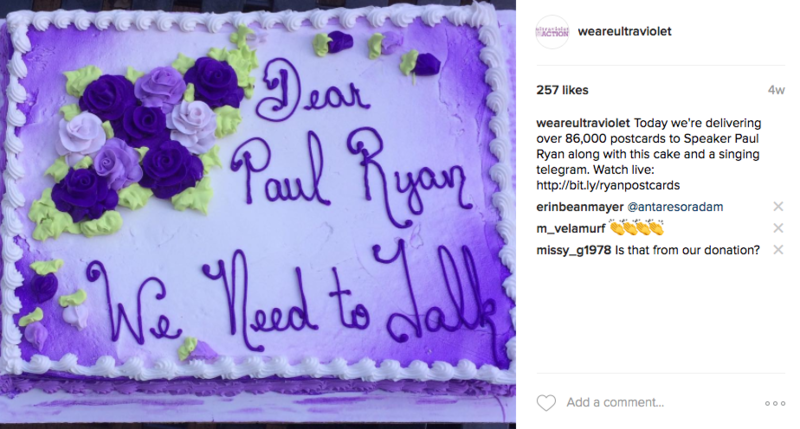 UltraViolet members helped stop TrumpCare. Here’s how. All the talk is about the RWNJ Republicans, but it also took the Dems staying strong. If any bill is to pass the House, let alone overcome a Senate filibuster, there will have to be a compromise with the Dems. Stumbled onto this. I like it. Humorous in nature, but dead on the money. but there is no joy in Trumpville — tiny hands Donnie has struck out. Not only that but the American Action Network still has the ads up on their YT channel as I'm posting this, 21 hours after the vote was cancelled and 12.5 hours after the article was posted! ... That's how utterly incompetent the right is on healthcare. "... That's how utterly incompetent the right is on [insert issue here]." In Dr. Strangelove, General Buck Turgidson makes the case for a nuclear first strike: "Mr. President, I’m not saying we wouldn’t get our hair mussed, but I do say no more than 10 to 20 million killed, tops." Paul Ryan has the same attitude towards 24 million Americans losing their insurance coverage. rstrong wrote: In Dr. Strangelove, General Buck Turgidson makes the case for a nuclear first strike: "Mr. President, I’m not saying we wouldn’t get our hair mussed, but I do say no more than 10 to 20 million killed, tops." Ryan: So, the health care entitlements are the big, big, big drivers of our debt. There are three. Obamacare, Medicaid, and Medicare. Two out of three are going through Congress right now. So, Medicaid—sending it back to the states, capping its growth rate. We’ve been dreaming of this since you and I were drinking out of a keg. - In the ClintonCare battle when Republicans were denying that anyone would be turned away from the Emergency room because they couldn't afford it, other Republicans demanded to know "why the hell not." The personal mandate was the solution. It was about personal responsibility; not forcing others to pay for your emergency room visit. It was mainstream Republican policy for 15 years until the moment Obama adopted it - at which point conmen like Ryan declared it unconstitutional commie Marxist socialism. - The Congressional Budget Office points out that ObamaCare is NOT in a "death spiral." President Donald Trump had kind words for the Australian health care system at a meeting with that country's prime minister Thursday, just hours after Republican members of Congress succeeded in passing their efforts to roll back the Affordable Care Act. “We have a failing health care -- I shouldn't say this to our great gentleman and my friend from Australia because you have better health care than we do," said Trump. :-0?> Even a broken clock . . . The remarks were quickly seized upon by progressive critics of the president, including Sen. Bernie Sanders, I-Vermont, who have long advocated for a government-run universal health care option, similar to Australia's Medicare system.